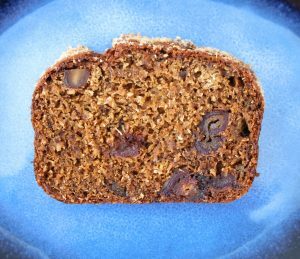 Who doesn’t love a bit of banana bread? This is a cracker of a recipe as it’s light and fluffy and doesn’t contain any refined sugar. It’s the bananas, dates and coconut sugar which sweeten the bread. Coconut sugar is less sweet than regular sugar so I don’t recommend swapping regular sugar for coconut sugar here as it will be way too sweet. You need only one big bowl for mixing so it’s relatively fuss free. It doesn’t need it but I can’t resist spreading some butter on a slice of this while it’s still warm from the oven to enjoy with a good old cup of tea. Pre-heat your oven to 180C. Using a fork or a potato masher, mash up the bananas to a purée consistency. Beat the eggs in a cup, then add them to the bananas along with the dates, coconut oil, vanilla, cinnamon, salt and baking soda. Mix the ingredients well before adding the sugar, coconut and flour. Mix well taking care not to over-mix it. Line and grease a loaf tin then pour the batter into it. Top with some desiccated coconut then place the tin in the oven and bake for one hour. Once cooked, place the tin on a cooling rack and allow to cool for about 10 minutes. Remove the banana bread from the tin and cool on the rack for about 30 minutes before serving. If you can’t wait, get stuck straight in but if you want to slice it neatly it’s best to allow it to cool, however it will still be quite warm after 30 minutes cooling.